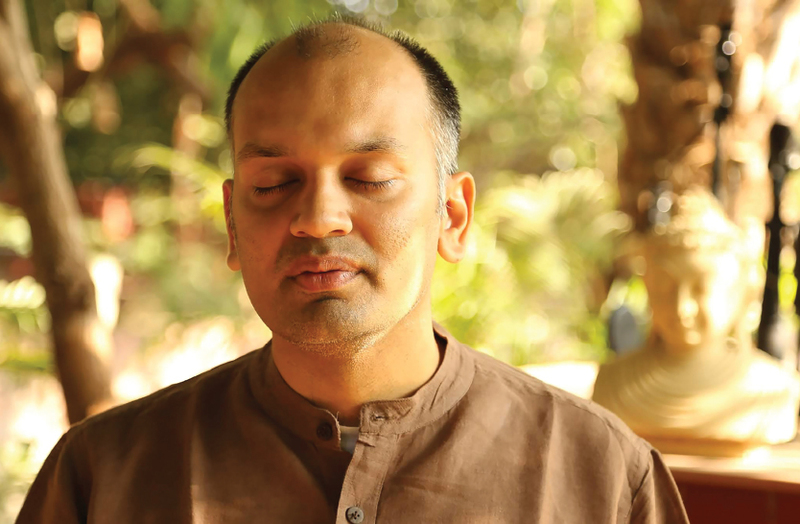 NIPUN MEHTA is one of the founders of ServiceSpace, Karma Kitchen, DailyGood, KindSpring and other organizations that successfully work within the Gift Ecology. From a young age, he was inspired by the need to serve others. Early role models like J. Krishnamurti, Gandhi, Swami Vivekananda and Goenka further fuelled that urge so that it has blossomed into a life of joyful, cheerful service. He was the recipient of the Dalai Lama’s Unsung Heroes of Compassion Award in 2014, and appointed to President Barack Obama’s Council on Poverty and Inequality in 2015. Here Nipun continues to explain the principles underlying the Gift Ecology to ELIZABETH DENLEY. Q: What happens in that dynamic of trust in relationships when people’s innate tendencies and fears surface? And of course they will, because we’re all human. We’re all carrying baggage from the past – culture, family, whatever – and these things arise. How do we deal with it? That’s why relationships are complicated. Anyone who has been in any relationship will tell you that it’s not so simple. It’s not like I give you five bucks, you give me the food and that’s the end of it. If I’m actually engaging with you in a multidimensional way, that’s going to evoke something – it may trigger me in certain ways. It may be much simpler and more convenient for me to not have that relationship and just engage in a transaction. So then why engage in relationships when it requires so much of me? Q: This is the critical question, Nipun, because this is at the root of so much that needs to change in our societies globally today. Not just in the West. It’s the same in India, and it’s the same in China. This is the million dollar question. Q: How do we work with relationships? It’s not transactional in the sense that people are not doing something for money, and they’re not even doing something for recognition a lot of the time. The whole ethos of service, seva, is anonymity, humility, the Gandhi values etc. So how do we build this culture of trust without having transactions, without having carrots, if you like? It takes many inner capacities that we need to cultivate. And if we do cultivate those inner capacities, the reward is that we get a high bandwidth engagement with life. So then we may ask: What actually happens when I’m in a relationship and certain parts of the relationship are difficult? And I have to now deal with those difficult parts to get to the high bandwidth engagement with life. I need to grow in equanimity, I need to grow in tolerance, and I need to grow in patience. It’s much easier in a consumeristic mindset, where we think, “Hey, I want this, I want it now, and I want to get to the next thing.” And if we keep doing it, that consumerism is going to get us to a very cheap engagement with life. So how do we build the virtues that lead to a higher engagement with life? And as we inch towards that high engagement of life, what we understand is that it’s never been between us and the other person in a one-to-one way ever. It’s just that we have reduced it to that. to a much deeper engagement in a much more multidimensional way. and in turn we can build trust in society. So who do I have to be when I see somebody harming me? Who do I have to be to hold that whole lineage of conditions and have a big enough heart to say, “I will endure this and rebound it back with compassion.” The reward for that is not just that the other person might be healed in some way, but that you are graced with an incredibly high bandwidth engagement with the present moment. We saw people like Gandhi do exactly this. Godse put 3 bullets through him, and Gandhi’s response was, “Bless you, bless you, bless you.” He was not condoning the negative action, but rather he was saying, “I oppose the action, but you are much more than that action, and I love you.” That larger ‘you’. So when we look at relationships and the inconvenience of them, it is actually an invitation to grow in virtue, so that we’re able to go from that cheap bandwidth to a much deeper engagement in a much more multidimensional way. And if we do that, then in that field so much can grow, and in turn we can build trust in society. Q: So will this spread, do you think, to all the Afro-American kids who are in prison, all the Latino boys who are in prison? You know there is a lot of cultural divide, even in a wealthy country like the US. And I know there are people like the Greater Good Science team who are trying to address those social issues, because it isn’t an equal playing field either. So who is responsible for this? You and I! We can’t lose our agency through this process. Even with generosity – we tend to view generosity as a luxury sport. We say, “Look, if you accumulate like me and become very successful, then you can give.” But actually it’s not a luxury sport. Those who have the least end up giving the most. My wife and I were on a walking pilgrimage in 2005. We ate whatever food was offered and slept wherever place was offered, and those who had absolutely nothing would borrow food to feed us. We are wired to care, we are wired to give, we are wired to be related – and neuroscience now confirms all this. So we know that we want to do this, but we need spaces where we can explore it further. Of course it will take time. This isn’t a quick fix; it’s not going to happen overnight; . As you said, we have a lot of inequities. But fortunately, generosity, compassion, kindness are not reserved for those who have ‘made it’. There is no worthy destination until we arrive at acting with compassion in any moment – even if it’s silent, even if it’s a humble prayer. I have had homeless people on the streets start out by asking me for money, and by the end they offer me money. It’s not that I’m asking for money, but it’s just that they feel a kinship, they feel a brotherhood. And when you feel that brotherhood, you want to serve that brotherhood. So how do we tap into that kind of agency and trust the ripple effect? This is not going to happen overnight, because the problem was not created overnight. It took a long time. It’s just that we weren’t paying attention when it was drip by drip by drip. We were de-capacitating ourselves drip by drip by drip. And now, drip by drip by drip we have to turn it around. So if you ask, “What’s the quick fix solution?” I would say there isn’t any. And so you may ask, “Are you still committed to that? Are you committed to spread love, to do that small act of kindness, to plant that tree under whose shade you will never sit, whose blossoming you may never get to witness?” I’m willing to do that. It makes me come alive. I don’t need that immediate feedback loop. So if you and I are willing to step into the space, then I think that’s the start of the revolution. Q: Right. So what are the projects in your revolution at the moment? What’s happening and what’s going to happen? What’s your vision? So ServiceSpace is an incubator of many different projects. We have some that are online, like DailyGood and KarmaTube. These projects create online communities, spread inspiration. Some are offline, like Awakin Circles and Karma Kitchen. 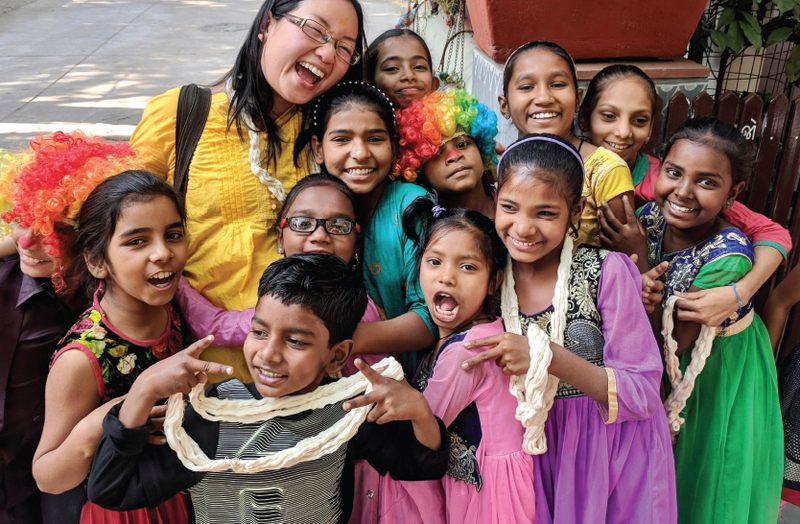 Some are in-between, like KindSpring, home of the Smile Cards, that create an online community, where people share stories, but the Smile Card act is actually in person, in offline space. The first principle is that we’re volunteer run. When no one is paid, we are driven entirely by intrinsic motivations. Initially, that sounds cute, when you’re starting and you say, “We’re five volunteers.” But when you’re 500,000, the field of intelligence, that field of purely intrinsically motivated intelligence, is just profoundly different in its patterns of innovation. The second principle is that we work with what we have. Not seeking or scheming. And the way it manifests concretely is that we never fundraise. We just say, “This is what we have,” so we work with what we have, which forces us to look at multiple forms of capit We’re no longer only thinking that money equals wealth; that is, we don’t think without money we can’t do anything. Quite the opposite. Money is one form of capital, but so is time, so is attention, so is technology, so are stories, cultures and so on. Our creative constraint invites us to engage with other forms of capital. The third principle is that we focus on small, which means that we never say, “Go out and try to change the world.” We never design for that threshold of impact. And when you’re small, the onus is on you to be the change. You can’t say, “Oh, I’m trying to change this in this person.” You say, “Oh, am I being the change?” And if I’m being the change, am I growing in equanimity? Am I growing in tolerance? Am I growing in patience? 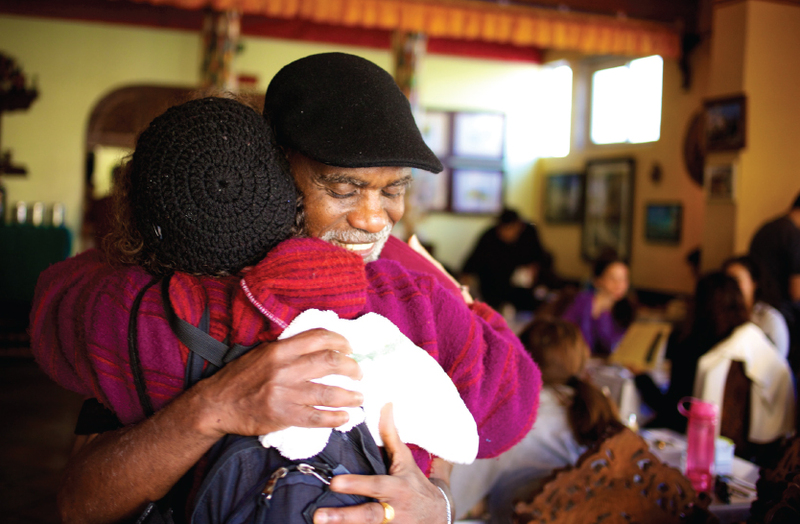 Am I growing in compassion, generosity, and kindness? Am I manifesting that in every relationship? And am I then trusting the ripple effect of that, as opposed to trusting the ripple effect of the might of one’s organization? So these creative constraints are what encompass the whole ServiceSpace ecosystem. So we have many projects, doing so many things and touching millions of people on a regular basis, but underneath them, the way I parse it is that it’s actually about the process underneath, which are these core values. Now, looking at the field, what is emerging right now? One thing that has recently emerged is this idea of a Laddership Circle. We talk about leadership, which is command and control, whereas laddership is about being in the back of the room, tuning into the myriad relationships that make up that community. And you change an ecosystem not by power, not by control, not by force and coercion, but actually by nudges, predicated on your capacity to know the interrelationships between everybody. For example, look at the way acupuncture works. If I have a neck ache, the acupuncturist may place a little pin on my arm – because the knee is connected to so many other parts and it creates this ripple effect that heals my neck. Similarly, we do that in a social context. It works in the same way, and it’s far less violent than other options. Then, the question is – how can we create a whole context, especially for young people, to hold all this, not as a leader, not as somebody who is mighty and centralized, but as a decentralized ecology that you hold with this kind of a heart? And that’s not something that is taught, and we don’t explore it. So we’ve started these Laddership Circles, which have been remarkable. We just had a Nobel Peace Laureate who joined one of these circles. They are peer-learning circles, so one person doesn’t teach another person. There are small groups of 6 to 8 folks, with 2 or 3 anchors who are just holding space on the side. And you’d be amazed how much we can learn from each other if get out of that hierarchical mindset. you hold with this kind of a heart? Q: So it’s an enabling model. It’s a model for growth. It’s not a manufacturing model but a gardening model. It’s something that’s emergent. Another project, which isn’t released yet, but which I’m excited about, is actually creating an eBay-like space, where you can pay not just with financial capital but also with other forms of capital. So I knitted this beanie for the love of it, because I enjoy knitting. Now you may be able to pay and maybe I need to get some money out of it. But I may also be happy if you go out and do an act of kindness and share the story with me. Or if you donate money to another NGO and send me the receipt. Or if you meditate for an hour and send me a reflection. We all know we value these actions, but we have never connected people in that sort of a way. And why not? So I’m very excited about this idea. There was a monk who came out with a CD, and he came to us and we were talking about how he was going to distribute it. We said, “You know, instead of just putting a price tag and doing the regular kind of distribution, why don’t you give people the option to also do an act of kindness and send you the story?” And hundreds of people sent stories! Can you imagine being a producer of value, in that sense, and receiving payment in alternate forms of wealth? Sure, I am not denying the power of financial capital. We all need money to pay our rent and pay our bills and things like that. But at the same time we can’t just blindly be focused on it. We can’t discount the immensity of other forms of capital that satisfy us, that nourish us, and that actually are regenerative, that nourish the person who gives, that nourish the person who receives. So how do we create a platform to facilitate these kinds of connections in a many-to-many sort of a way? I am excited about that. Q: That’s a real gifting ecosystem. Yes. And isn’t it amazing that we have all these innovations and technologies and we don’t think about alternate capitals? It’s almost like back in the days when NBC, CBS, and other centralized TV stations were there doing the work, but none of them could come up with a YouTube, because they were so entrenched in that worldview. Similarly I think that this is the time when spiritual people really need to get active, and active people get spiritual. We’re in a time when that kind of intelligence needs to arise. The innovation that came from YouTube disintermediated the NBCs of the world, and we saw it happen across the board: CDs turned into iTunes, billboards turned into Google AdWords. But now how do we bring these spiritual qualities into greater circulation, leveraging modern technologies and their new possibilities? And I think that’s the potential of our times and the need of our times. If we don’t do that we are going to continue to strip down of what it means to be alive. Q: And if we do do it? If we do do it, then I think we’ll have a higher engagement with life and a lot of virtue will grow in the field of our relationships, of our deep relationships. And I’d rather see that kind of a world. 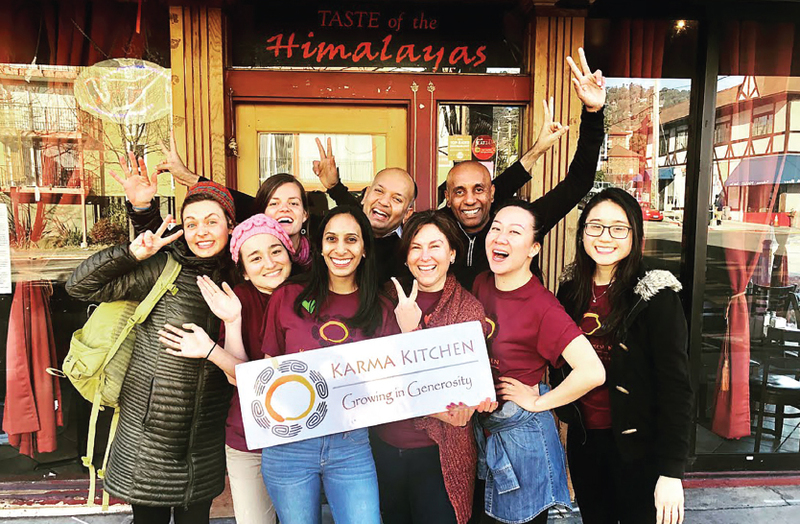 Founder of ServiceSpace, Karma Kitchen, DailyGood and KindSpring, he successfully works to integrate the Gift Ecology, technology and volunteerism. He is recognized globally for creating a culture that brings harmony and inclusiveness.